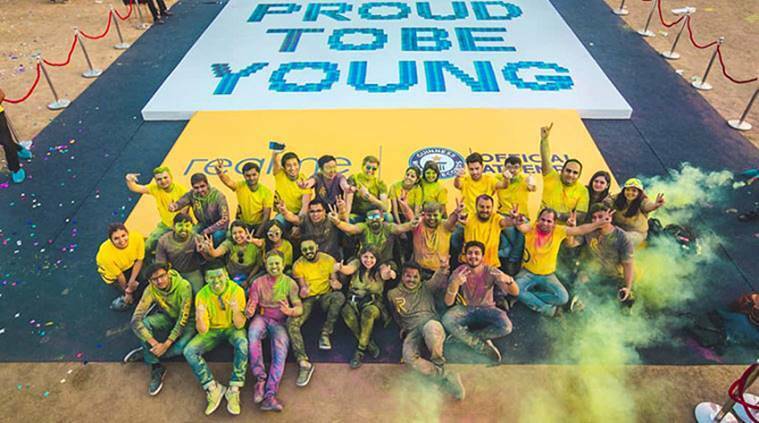 In a day-long celebratory event and the first ever Holi bash organized by Realme, the young brand earned GUINNESS WORLD RECORDS title by making 1024 Realme 3 Radiant Blue devices to spell "Proud to be young" brand slogan. The new record holding brand- Realme was declared officially amazing in front of 500 Realme fans. Realme, the No. 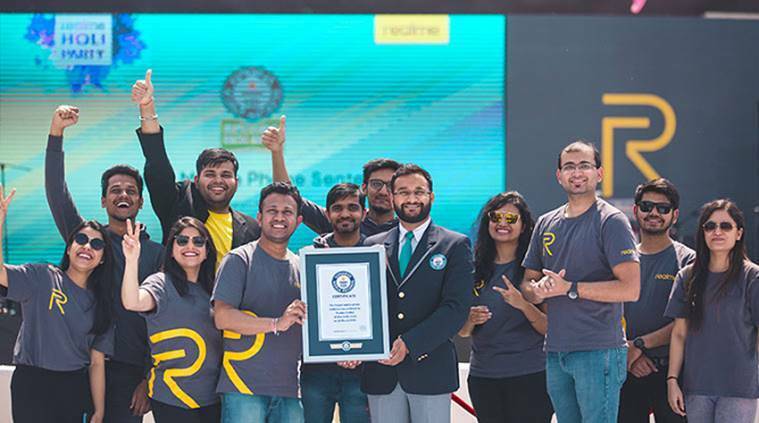 1 emerging smartphone brand in India has achieved another milestone by creating the longest ever phone sentence at New Delhi on 16th March 2019. 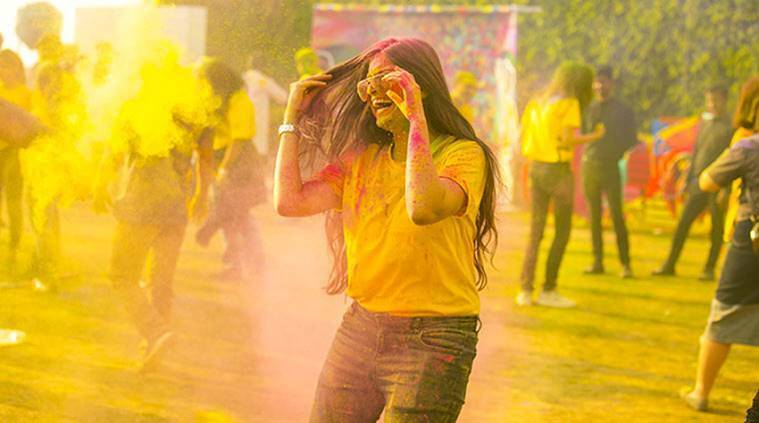 In a day-long celebratory event and the first ever Holi bash organized by Realme, the young brand earned GUINNESS WORLD RECORDS title by making 1024 Realme 3 Radiant Blue devices to spell “Proud to be young” brand slogan. 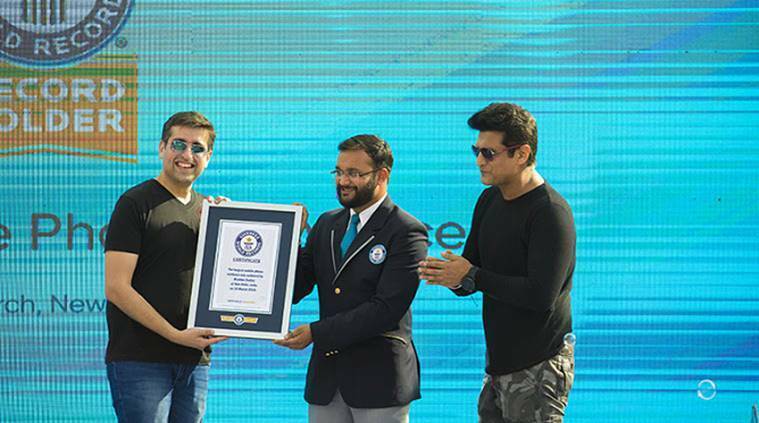 The new record holding brand- Realme was declared OFFICIALLY AMAZING in front of 500 Realme fans and media combined and it certainly was a moment of immense pride and joy. This was for the very first time that something like this has been attempted with smartphones and this in itself is a remarkable achievement. Realme is a technology brand that specializes in providing high-quality smartphones. The brand was officially established on May 4th, 2018 by its founder Sky Li and Madhav Sheth in India, together with a bunch of young people who have rich experience in the smartphone industry. In a span of just nine months, the brand has already sold more than 5 million units. An excellent combination of powerful performance, sincere services and impeccable designs with budget-friendly tags make every launch a huge success. Realme has launched 6 products by far, which includes Realme 1, Realme 2, Realme 3, Realme 2 Pro, Realme C1 and Realme U1. Realme, the No. 1 emerging smartphone brand in India, launched Realme3, the most powerful phone in the budget segment today. Here is why Realme 3- the fastest growing smartphone brand in India can become one of your best purchases for 2019. In order to achieve a singular and seamless product experience and a good hand feeling, Realme 3 has adopted a 3D Gradient Unibody Design. It has set the highest standard among Realme series in terms of hands-on and visual experience. Through the uni-body process, Realme 3’s back cover and mid-frame are formed in a whole piece, bringing you a seamless design and a complete sense of grip. The device comes with 3 exquisite colors – Radiant Blue, Dynamic Black, and Classic Black. Realme 3 Dynamic Black can deliver wonderful gradient effects between blue and purple when being observed from different angles, while Radiant Blue delivers a stunning and reflecting effect. 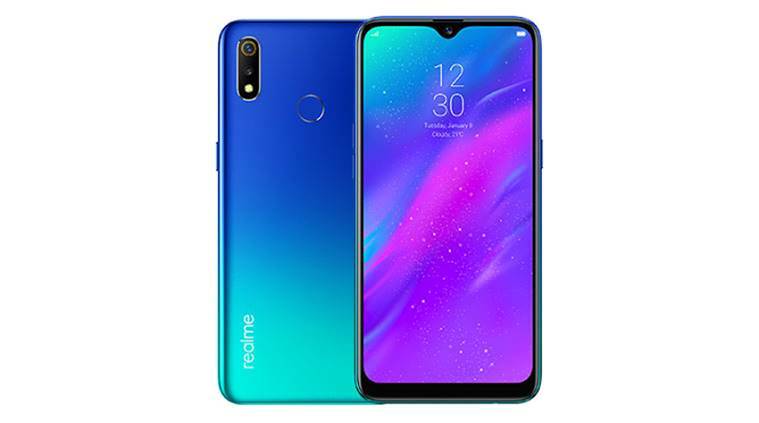 Realme 3 Radiant blue, the most fashion-forward and on-trend color is quite the statement piece for someone looking for a truly unique phone which offers a smooth touch and comfortable grip. The device comes with a dual rear camera, a combination of a 13MP primary camera and a 2MP secondary camera with the primary camera’s single pixel size being 1.12um. The large f/1.8 aperture and 5P lenses combination is a big leap forward in resolution, tolerance, and color presentation. Nightscape mode: Based on upgraded hardware configurations and better imaging quality, Realme 3 is the first to introduce the Nightscape mode into this price range. The Nightscape mode significantly improves the imaging quality in dim light. The mode enables the device to greatly increase exposure in dim lights, thus improving more details. Chroma Boost mode: To meet the user demands for better imaging effect, color and style, the smartphone has been added with the Chroma Boost mode. Using AI technologies, scenes in photos are recognized and optimized accordingly into a larger dynamic range, with more enriched details in highlighted parts and shadows, and more balanced exposure. Processor. The powerful Helio P70 adopts TSMC’s latest 12nm FinFET process, which boasts a 15% drop of power consumption compared with the previous 14nm process and can rival the 10nm chip in this regard. P70 comes with multi-threaded APU (AI Processing Unit), which includes multi-core processors and smart control logic processors. When combined with NeuroPilot and the brand new smart multi-thread scheduler, it can be two times more efficient in power consumption than GPU. It can achieve 280 GMAC per second in terms of computing processing capacity, making the processor the most powerful artificial processing terminal among its same level. Realme 3 is just the right pick for all gaming experts. The device provides game optimization functions such as performance mode, do-not-disturb mode, and brightness lock. Realme 3 also features the Hyper Boost technology that can boost more resources to improve heavy gaming performances. Additionally, whenever a new game app is installed, it will be recognized and included in Game Space. What’s better than a perfect game management system for a user? The phone has a triple slot to house two SIM cards and a micro SD card for additional storage. Realme 3 is the most powerful phone in the budget segment today. The new launch is presently the best value-for-money device in the market. With outstanding features also comes the affordability and given a complete budget-friendly package, it is an absolute steal! Ever since its inception, Realme has proven itself to be an ambitious brand. While the Guinness World Record title makes the brand OFFICIALLY AMAZING, the exceptional features make every device a standout. What’s more interesting about the brand is that it has been able to carve out a name for itself despite rigorous competition in the Indian market. The affordability of the new flagship phone is all the more impressive. The budget segment of 10k and less makes it an instant purchase and nothing’s better than having the perfect smart device without having to compromise on your budget. From a powerful processor, additional storage, longest battery endurance to an elegant appearance, every feature will add more to your experience. 1 After Redmi Note 7, is Realme 3 redefining the budget segment in the smartphone segment again? 3 Packed with features at a super affordable price, the OPPO K1 is finally here!